From Şehir Hatları (Public Ferry offered by the municipality) to luxury yachts, there are many options one can enhance their Istanbul experience on the cool waters of the Bosphorus. It is one of the must-do activities in Istanbul. Here is a brief description to most of the options I know of. After reading this article you should be able to figure out the best Bosphorus cruise that fits your budget and style. Bosphorus cruises are offered by public and private companies in a wide range of crusing options mostly on yachts, ferries, and motorboats. In general, tourists—Turks and foreigners alike—opt for a two- or six-hour tour (“short” and “full” tours, respectively) with Istanbul’s public Şehir Hatları fleet. These are the same style ships that run between the European and Asian sides of Istanbul countless times a day, though the tour ships are a bit bigger. Leisure style Bosphorus Cruises are mostly offered from Eminönü, and the ferries, motorboats leave Eminönü at regular intervals, and are a classic and inexpensive way to enjoy the Bosphorus. Below map shows you the main routes of Bosphorus Cruises offered by the Şehir Hatları. You will get to see both the Asian side and the European side shore up to the point where the second bridge is located between Kanlıca and İstinye. The Full Bosphorus Cruise is a great way to see the entire Bosphorus, and have a stop for lunch/late lunch at Anadolu Kavağı in between. You can also take it one way, and pay 15TL (~$7) or take the full tour for 25TL (~$12). This tour runs everyday, however, the trip schedule back to Eminönü fluctuates between weekdays and weekends - be aware. Did you know that Anadolu Kavagi is also home for Yoros Castle? 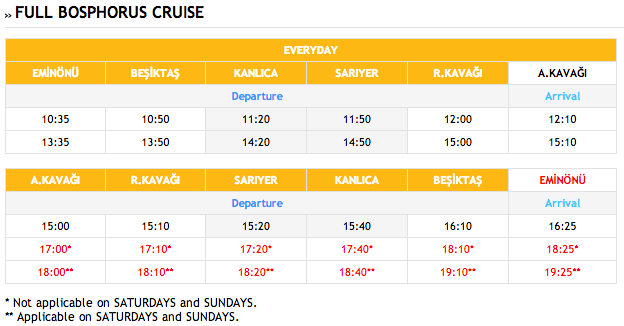 The Short Circle Bosphorus Cruise costs 12TL (~$6) per person.Please check the offical cruise prices table for updates. Sunset Cruise is offered on SATURDAYS between June 7th and September 13th. You can take the ferry either from Bostancı (Eastern-Asian side) at 5:30pm, and complete your cruise at Anadolu Kavağı (Northern-Asian side) at 8:05pm, or take it from Anadolu Kavağı at 10:30pm, and get to Bostancı at 1am. Perhaps you can take both in a row, and fully satisfy your needs, and won't need another Bosphorus Cruising for quite a while. Check the official timetable for the Sunset Cruise for updates. 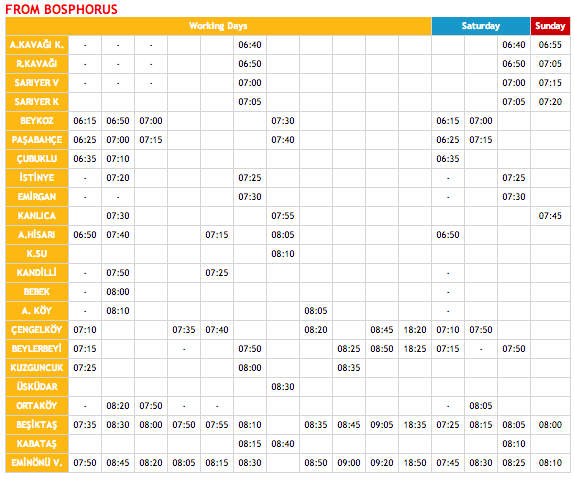 Below is the schedule for the Bosphorus Lines. 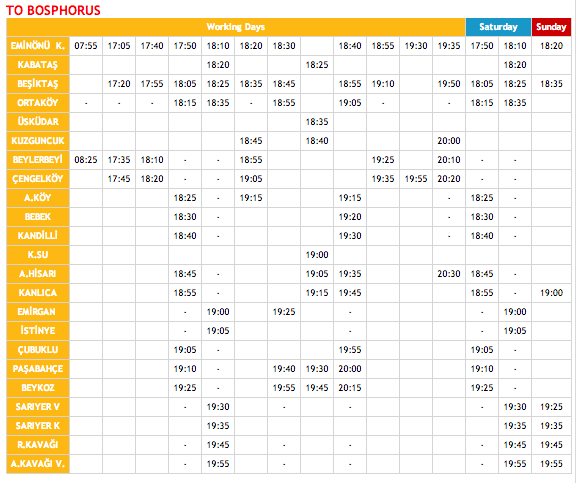 Please also check the Official Timetable for Bosphorus Lines updates. If you'd like to take the short commuter ferry rides to watch the locals in their daily habitat, you can also take the commuter ferry from the docks around the city. You can find the timetable at Şehir Hatları website. This might get complicated, however, you will wait around 20min for the next ferry, if you miss one. Inner Istanbul Ferry Lines are one of the main means of transportation among locals, and they run frequently. Şehir Hatları tours offer an authentic experience at a low price, however, they have their downsides. Though the ships are large, the decks may get crowded easily, making it difficult to see all that the Bosphorus has to offer. The top deck, the largest outdoor area on the ship, is only partially covered, so it’s hard to stay protected from the sun and keep a good vantage point. And while it’s fun sailing with a big group of people, the Şehir Hatları ferries offer little privacy, which can be wearing by the end of a long tour. This is the TURYOL (Tour and Passenger Transportation Cooperative) that offers inner city, and Bosphorus tours on motorboats. The Bosphorus tour takes 1h30min and costs 12TL (~$5). You can take it from Eminönü, Üsküdar, or Kadıköy. Please check their offical schedule for updates. Trips from Eminönü occurs pretty much every hour. Here is a photo of the TURYOL motorboat, which has a covered rooftop. However, you need to act fast to be able to get a spot on one of the sides for the best view. Deniz Taksi is a private, and semi-fancy option providing practicality and exclusivity on the Bosphorus. Deniz Taksi can be used for Bosphorus cruise, and will take you anywhere you like. They also can also be used for airport transportation combined with their private car service that shuttles you between Bakırköy seashore and Atatürk Airport. Their website says that they are also available for your special events. They are available pretty much anywhere along the Bosphorus. It doesn't matter whether it is the European or the Asian side of it. Sea cabs can come and get you or drop you at anywhere there is a dock. It costs 25TL per mile (starts with 40TL - flag drop), and available on demand (if they are not booked) via 0850 222 4498. Please check Deniz Taksi Website for up-to-date information. Deniz Taksi suggests making reservations the night before your trip, if it's high season. During day time, there are a lot of free sea cabs laying around. As far as I know, finding a free sea cab via their customer line shouldn't be of an issue, unless there is some sort of an emergency situation in the city. On the other end of the spectrum are private yachts, which can be chartered for a wide range of prices and distances. Many private ships dock in quiet areas like Kuruçeşme, Bebek, and Ortaköy, which are a world away from the hustle and bustle of Eminönü and Sultanahmet. Many private ships can comfortably fit twelve or more people, though romantics often charter ships for two. Zoe Yacht is a great option for those looking to book a private tour of the Bosphorus. Private yachts are a great option in general, considering the fact that you can take it to anywhere you like around Istanbul. The most popular trips are Bosphorus Cruise, Golden Horn Cruise, Princes' Islands Cruise, Black Sea Swimming Trips, and many more. In this case, Zoe Yacht’s captain is an experienced fisherman on the Bosphorus, which gives him a special knowledge of the strait’s currents and rocks, allowing him to guide the ship with ease along the shores of Istanbul and between the Bosphorus’ tanker traffic. You definitely want to have the most experienced captain on your side considering the fact that there are many motorboats, ferries, yachts, and tankers running around. For those looking to drink and/or dine during their cruise, private cruise companies can provide food and beverages, (or you can bring your own), or they can drop you off at one of the restaurants (like Lacivert) or clubs (Reina, Sortie, Anjelique, etc.) along the Bosphorus at the end of your cruise. This is also very popular among the travelers who are staying at the hotels on the Bosphorus, such as Four Seasons Bosphorus, Çırağan Palace Kempinski, Ajia Hotel, and more.